Among the essential playing equipment for any baseball player is the baseball bat. Besides appropriate training on how to apply art and science to hitting a baseball correctly, without the correct bat, it would be a waste of time. No matter the level you play for, acquiring the right baseball bat is crucial. When choosing the right bat for your baseball season, it is significant to know the rules of your program. All seasons have specific laws about the type of baseball bats prohibited and allowed in the game. Second, consider the length of the bat you require. You should also consider its weight. If a bat is too heavy, you might just drop it when taking a swing at the ball. Several other factors to acquire the right bat would be the age of the player, their height among others. The Easton Mako Beast baseball bats put all the above aspects into consideration and manufacture the right bat suitable for any season and age. Why Easton Mako Beast is Best? Three significant things make the Easton Mako Beast bats the best in comparison to other bats in the industry. These aspects are its performance, design, and Easton’s experience in making the perfect baseball bats for all seasons. Easton experience for over the past decades in the baseball bat industry makes it the most prominent company when it comes to manufacturing baseball bats. Ever since the manufacture of the first aluminum bat in 1969, the bat advancements they manufacture increase year by year. The Easton Mako Beast bats are part of the bat advancements. Using advanced technology, the Mako beasts become a baseball player’s best friend. The Mako beast performance is unlike anything other bats have. All the Mako bats come fitted with new and reliable technology that make the bat more durable and fast. Some of the technology that goes into making the bats includes Thermo Composite Technology, Handle improvement and the Hyperskin Technology. Finally, the Easton Mako Beast bats designs are impeccable. The models for each bat enable the player to acquire a balanced swing with appropriate weight distribution. The two-piece construction in each Mako beast bat, allows the baseball player have a smooth overall performance in every game. Here are a few Easton Mako Beasts bats for different seasons you can acquire. This bat is appropriate for baseball players who require a bat that is compact while not in use and it will still offer them the confidence to use it, without the bat falling apart during a game. The Easton BB17MK Mako provides every baseball player that feeling. It is a composite bat with BBCOR certification. It means that the Easton BB17MK is a standard bat useful in all high school and college baseball plays. The combination of its two-piece barrel and weight provides the player with excellent bat balance for the perfect pitch. The Easton BB17MK is a two-piece composite bat that is perfect for players with a powerful hit. The two-piece construction of the bat ensures the bat is balanced and not end loaded giving the player an ideal swing. Like all Easton Mako beast bats, Thermo Composite Technology is used to make the Easton BB17MK. The TCT is a material that allows few vibrations while the bat is in your hands when hitting the ball. The bat also has a cushioned Hyperskin grip that offers players an improved grip for a steady and softer grip of the bat. The Easton BB17MK has a sturdy grip and is perfect for a baseball player who needs to work on their baseball bat grip. The bat’s warranty runs for one year. The bat has a minimal aftershock on its handle because most of the energy remains in the barrel. It enables the bat snap back an energetic slam to the ball. The bat is light and has excellent weight. It might take time for baseball players to adjust to the extra 1 ½ inch on its length. Despite the cons of the Easton BB17MK, the bat is still a quality must have. Its two-piece construction is an excellent addition to its other features. The two-piece construction of the bat adds class to the bat by maximising on the energy transfer potential of the bat. The energy transfer potential of the bat keeps the energy shock in the barrel and does not transfer it to the bat’s handle. The Easton BB17MK also comes with different colour picks black, grey, and white. Utilizing the Easton BB17MK for all your baseball games and practices will not only make you the best player but allow you to have confidence in your bat as well. Easton YB17MK11 is a youth baseball bat. Youth baseball bats are famous in the baseball world as Little League bats. The Easton YB17MK11 is useful to baseball ball players in Little League games. The Easton YB17MK11 Mako beast little League bat is fitted with features and measurements distinct in all little league bats. Some of the distinct features would be its two ¼-inch barrel and a drop weight of between -8 to -13. This youth bat is for baseball players who desire to perform extraordinarily in their entire little league season competitions. With a combination of all its advanced features, the Easton YB17MK11 youth baseball bat guarantees you excellence in the field. The Easton YB17MK11 youth bat is a composite bat made entirely from composite materials. The bat also has the Thermo Composite Technology (TCT). This technology encompasses using unique composite materials while constructing the bat. The Thermo Composite Technology provides the Easton YB17MK11 bat with a spectacular lightweight profile. The lightweight profile of the bat offers players an opportunity to achieve incredible hitting speeds. It also has a two-piece design, which utilises the Easton ConneXion technology. The ConneXion technology establishes a connection between the barrel and the handle. The link between the barrel and handle enable the bat to minimise vibrations on the handle and maximise swing force on the barrel. The bat has an ultra-thin handle that measures between 29/32 inches. The barrel diameter is two ¼ inches, the recommended size for all little league bats. The Easton YB17MK11 youth baseball bat has approval for use in major youth leagues. The bat has a patent design. It has a Hyperskin grip that provides players with a steady, strong grip while swinging. Has a weight drop of -11. The Easton YB17MK11 youth bat has a good pop. The upgrade done by Easton to the Easton YB17MK11 youth bat is impeccable. Parents and teams who desire the very best for their little league players will overlook the cost since nothing is too much when it comes to excellence. Design and functionality are packed in the Easton YB17MK11 youth bat ensuring perfection in all your little league players. The bat allows the little players to perfect the art and science of hitting the ball correctly while gripping the bat appropriately. It is never too early to learn how to become a professional baseball player at this age while working closely with the bat as their training tool. The Easton SL17MK10B senior league bat is not only made with superior performance features but style as well. One look at it and you will fall in love with the bat. The bat incorporates a trending colour combination, which offers the player a sense of style while holding the bat. 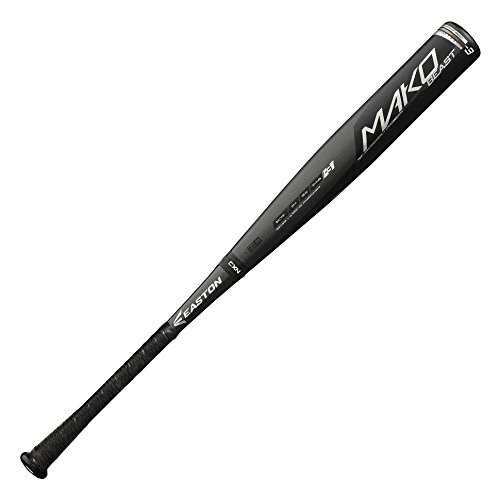 The senior league bat has the most powerful and biggest barrel composition of all the Easton Mako Beast baseball bats. The bat is a beast when used on the baseball field. It combines your baseball professionalism and its barrel power and composition and ensures you shine in the field. The Easton SL17MK10B is a composite two-piece bat that combines the two Easton technologies, the TCT Thermo Composite Technology, and Patented ConneXion technology. The ConneXion technology provides the bat with a connection between the handle and barrel. It ensures the connection between the barrel and bat is stable with minimal vibrations on the handle. It also guarantees higher transfer of energy every time you hit the ball. The TCT, Thermo Composite Technology increases the bats swing speed while maintaining a significant width. The bat’s two ¾ inches barrel provides the players a significantly little moment of inertia and swing weight that is balanced. With the combination of the two resultant aspects of the size of the barrel, you get to complete extra home runs than you ever thought was possible. The barrel size comes with a 29/32 centimetre size composite handle with a 1.2mm grip. The size of the grip is ideally large enough to prevent the bat from slipping off your hands because of sweat. The price of the Easton SL17MK10B is quite reasonable. For players who desire to enhance their performance in every baseball game, acquiring the Easton SL17MK10B Big Barrel Baseball Bat is the first step. The bat also comes in handy for any baseball player who wishes to play professional baseball. It provides you with the opportunity to practice your swing speed and become comfortable with the use of high-quality baseball equipment like this bat. You can swing your bat with confidence. The combination of technology and the barrel size will ensure you get the most out of the bat. The Easton Senior League, Big Barrel Baseball Bat, has approval for use in AABC, Pony Baseball, and USSSA. To perform well in any junior baseball league, it is essential for junior players to acquire high-quality baseball equipment like a junior big barrel baseball bat. The Easton JBB17MK12B Junior Big Barrel may be a little heavier in comparison with standard bats. However, for any junior baseball player looking for a chance to improve their baseball performance, Easton JBB17MK12B is the appropriate bat to use. It is a great bat when it comes to perfecting the art of swinging and hitting the ball. Here are a few reasons why the Junior Easton JBB17MK12B baseball bat is perfect for your junior baseball player. The bat is constructed with a two ¾-inch barrel that extends 1.5 inches longer than other Easton junior big barrel bats. The extension of the barrel is to ensure that the junior player gains control of the two ¾-inch barrel while swinging the bat. The Easton JBB17MK12B junior big barrel model is constructed using advanced IMX composite materials. The composite materials utilised in the bat’s construction enables it to optimise the sweet spot. It also makes the Easton JBB17MK12B bat light in weight. The walls of the Easton JBB17MK12B junior barrel are thin, offering the bat a trampoline effect while hitting a ball. The barrel is connected to a handle that is ultra-thin with a measurement of 29/32 inches. For extra grip, the handle is reinforced with a material that makes it comfortable to hold the bat. The composite materials that go into making the bat enable it to be more durable than earlier versions of the Easton Mako Beast junior big barrel bats. Specifically designed for junior baseball players. You can never go wrong with the Easton JBB17MK12B junior big barrel bat. Apart from being the right bat to build your junior baseball player skills in the game, it comes with a one-year warranty. Ensure you offer your child the best when it comes to growing their talents and skills in baseball. The Easton JBB17MK12B junior bat is specially crafted to suit every baseball need your junior player requires while on the field. The bat bears a USSSA stamp making it certified according to baseball rules. With the 30 plus years of making the best baseball bats, Easton outdid themselves in the creation of the Easton Mako Beast collection. Each bat is made with careful consideration of its users to help them perfect their baseball performances. Easton combines style and technology to produce the best bat categories the market has ever seen. The Mako beast collection is an improvement to other bats that Easton has ever produced. The perfection features of the Mako Beast bats collection are in their design and power. For baseball players who take their game quite seriously, acquiring the right equipment is essential for them. The Beast collection of bats have an extra edge of power other bats do not. The two-piece design in every bat offers you more flexibility in comparison with one-piece bats. The use of the Easton Mako Beast bats by younger players enables them to increase their swing time. It also offers them a chance to improve their baseball techniques without derailing them from their professional baseball goals.